Deloitte invests in outstanding people of diverse talents and backgrounds and empowers them to achieve more than they could elsewhere. We believe that when our clients and society are stronger, so are we. We offer a wide variety of interesting employment opportunities and are continually looking for key external talent to complement our existing workforce and enhance our organizational strength. In addition to rewarding and meaningful work each day to empower the children and families of New York, The Foundling offers a benefits package, internal culture, and organizational stability that are unparalleled anywhere else. As an employee at our world-class, patient-centered, integrated academic, medical center, you can make an impact on the lives of others in an environment that will allow your skills to shine. Learn more about Premier's Commitment to Excellence and open positions in direct health care services, health administration, clinical case management, information technology, payroll, billing, and collections. PSEG's 13,000 employees have a strong tradition of giving back to, and being leaders in, the communities where they live and work. The VA Medical Center in the Bronx is the oldest VA facility in New York City, celebrating over 75 years service to veterans. The Medical Center is situated on a historic site in the borough of the Bronx. To learn how to be added to the list please call 1-888-550-3777 or use the contact us form. 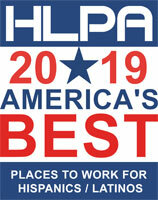 Each year the HLPA matches the Nation's Top Hispanic / Latino Talent with America's Best organizations by identifying and listing quality organizations who are currently hiring and have a commitment to Diversity & The Hispanic / Latino Community. These LISTS represent thriving organizations with solid ethics and a proven responsibility to their employees.